The bustling, hip French town of Saint Maximin la Sainte Baume is full of crowded cafes spilling onto the street, though that’s not what it’s known for. What may surprise you most of all is how all that jazz sits right in front of the imposing and massive Gothic Basilica of Mary Magdalene, founded in 1295. Drive 15 minutes away from this centre ville (town center) destination, and you’re at the base of a trek through the forest, up the Great Massif to The Grotto. How to do it? St Max sits east of Avignon and is easy to access by driving (one and a half hours) or by TGV (fast train) to Marseilles, where you can pick up your rental car at the gare (train station) and head to your accommodation. 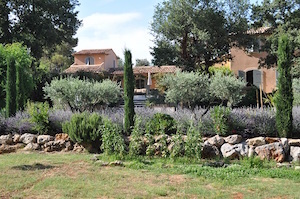 Situated just outside of town is Le Clos Geraldy, a French B&B (or Chambre d’Hotes). Casually elegant, well-appointed private rooms immerse you in the natural beauty and tranquility of an authentic French countryside experience. Your first refreshed morning, after a breakfast table full of hot brew, croissants, and choice regional fare, hop to centre ville to shop, find a cafe, or have lunch, then head across the platz in the blinding, hot sun that’s bouncing off every stone, nook, and cranny, and walk through the creaking, massive doors of entry into what from the outside appears as not much. Deceptively simple as you approach, the interior may well take your breath away over and over again. Be sure to visit the crypt, which houses the relics of Mary Magdalene. Your second morning? Consider The Grotto. It’s about a 45-minute walk to the top at a leisurely pace. The earlier you arrive, the longer you have to enjoy the forest, the 360-degree views from the top, and the cave or Grotto of Mary Magdalene. The large, open parking area gives access. 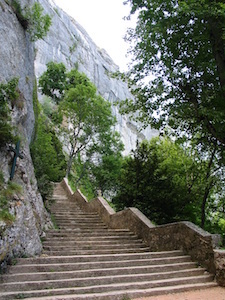 From here, you’ll begin a climb up the Great Massif. It is well-paved, with benches along the way, and not too steep. Bring water and snacks if you think you might get hungry, as there is no commerce on this hike. Regionally, leisure activities abound, from golfing to visiting olive groves and tucked-away places of interest only known locally — or simply book an on-site massage and sit by the pool. If it’s not too hot, take a day trip into the old quarter of Marseilles. Your host, Thierry, is happy to recommend restaurants that cater to you, from brasseries to fine dining. A favorite of mine sits in a 12th century abbey courtyard, home of Alain Ducasse’s Hostellerie de l’Abbaye de la Celle. This ‘restaurant gastronomique’ offers you the pleasure of the high art of French cuisine in exquisite surroundings.